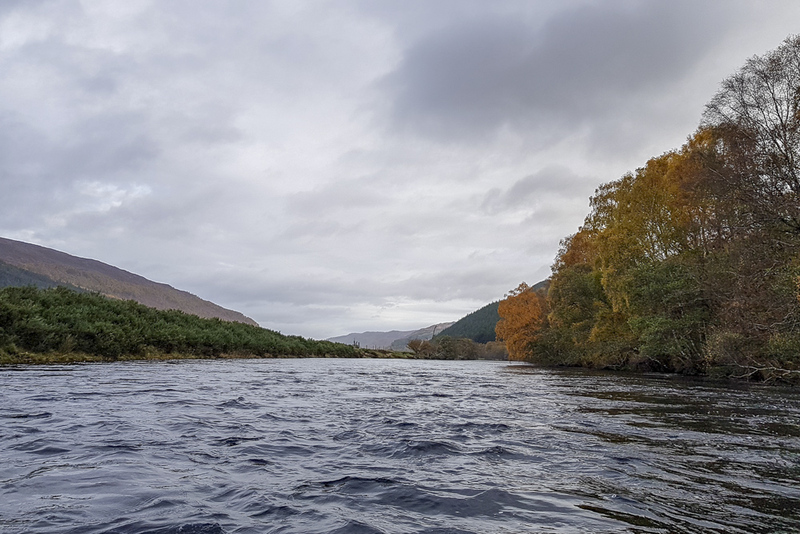 The final day of my autumn trip to the Glen Affric area dawned windy and overcast, much as the rest of the week had been. 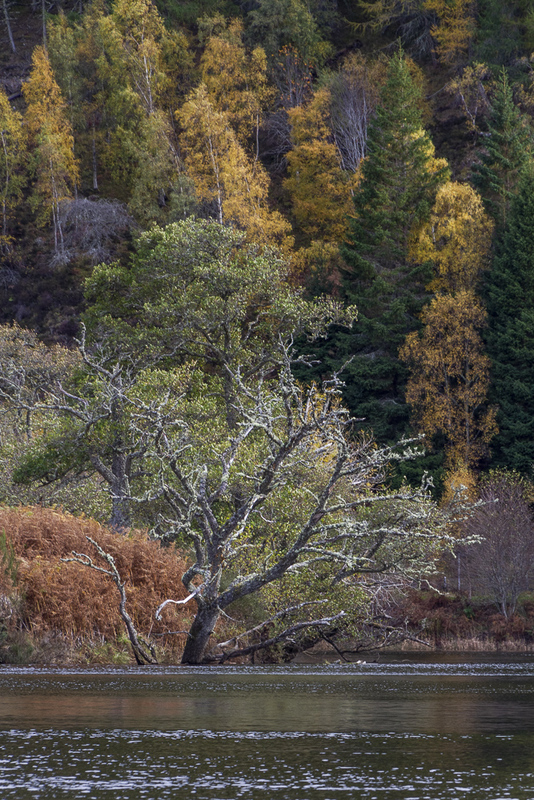 Strong westerlies still blew over the North-west Highlands while the rest of the UK enjoyed much calmer conditions. 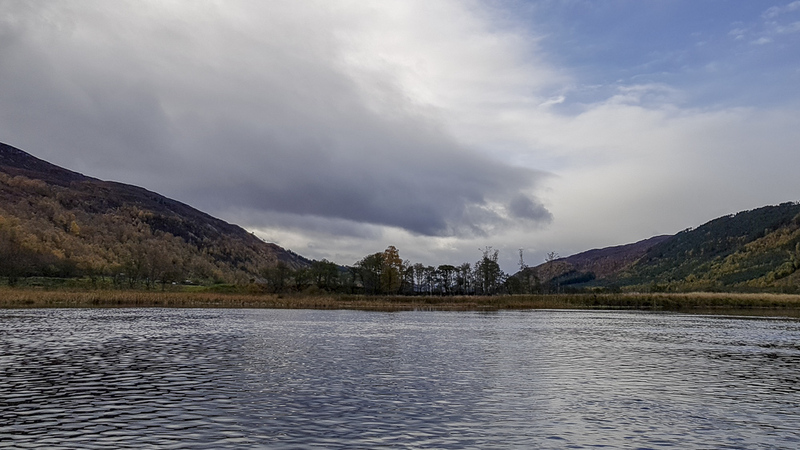 Local forecasts suggested exploring the lochs higher in the glens would be at best a fight with the weather, at worst downright dangerous, so I looked for a lower level journey where the wind might be an asset. Water levels on the Glass had been high all week, and still looked good today, so I decided to paddle the upper stretch of the river down to the confluence with the Farrar. 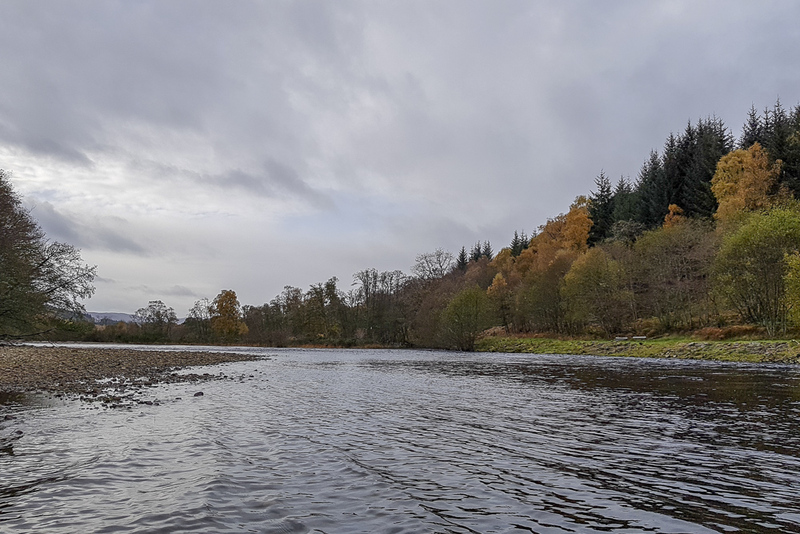 A bit of map work showed me a convenient get-out at Mauld Bridge, just short of the confluence, and a handy bend brought the river close to the road at Comar Wood, a kilometre or so upstream from Cannich. I was travelling solo again, so needed to sort the shuttle. The bike was duly locked up under Mauld Bridge and I drove back to the campsite to collect the boat. 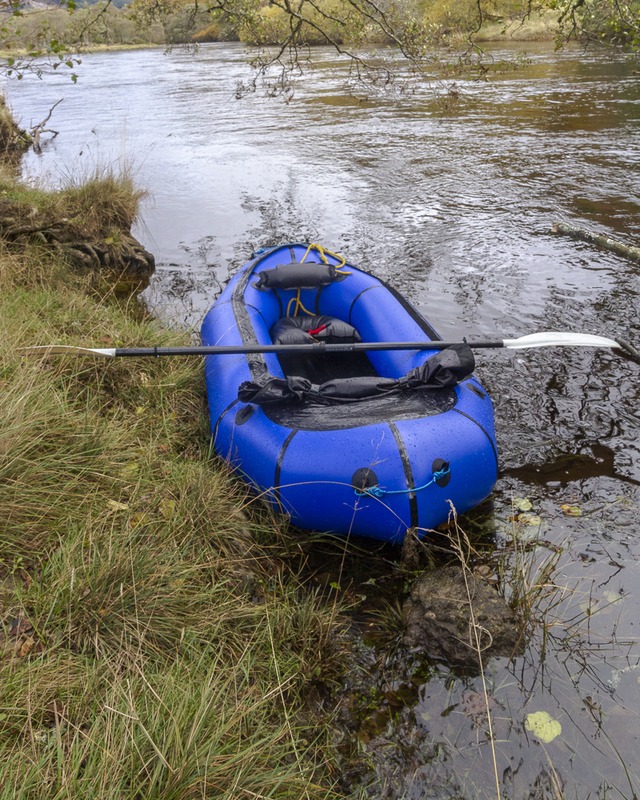 I had decided to use the packraft again for this trip, but wanted to see how it handled without a load on the bow, hence dropping the bike at the end first. A short walk along the road took me to my get-in, a pleasant grassy bank with a couple of benches conveniently placed to help me get my stuff organised. Blowing the boat up went quickly again, and I chose to try the deck today to see how it performed. 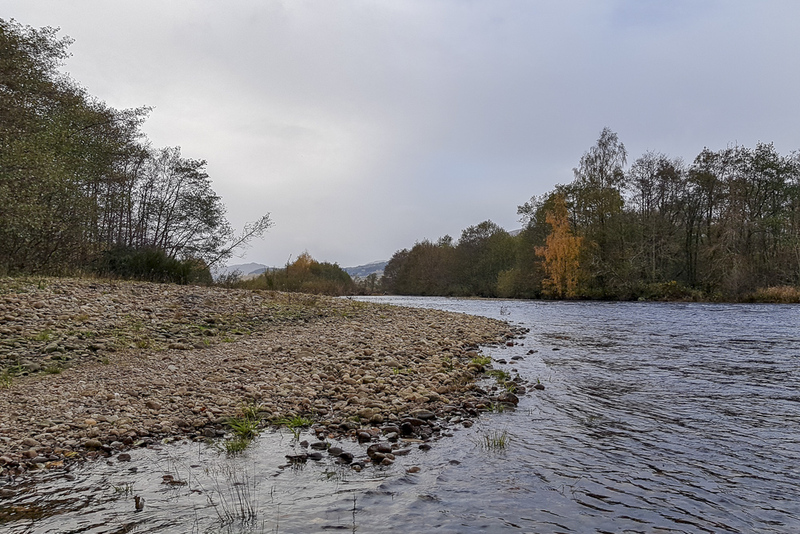 The river was shallow and fast running over gravel beds at the put-in, and it continued through fast bends with gentle drops over shingle bands around each corner. 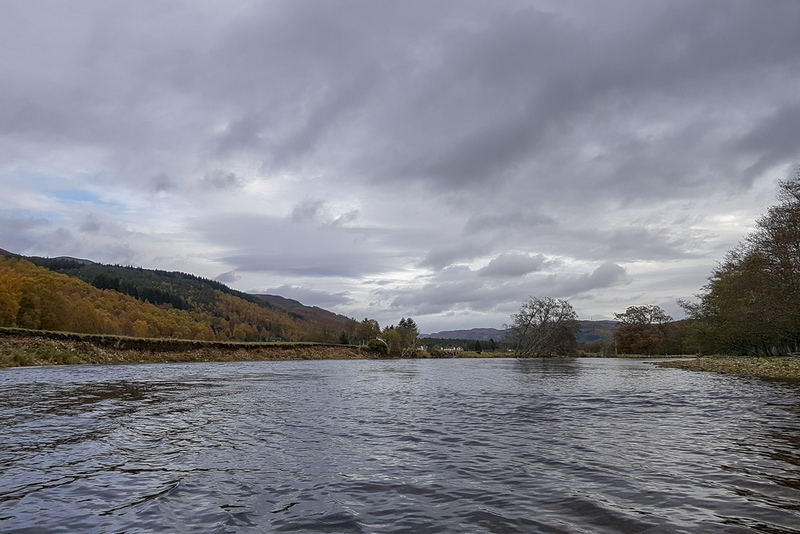 The hamlet of Comar whisked by on river left and before long I was approaching Cannich once more, with Comar bridge peeping into view round the bend. 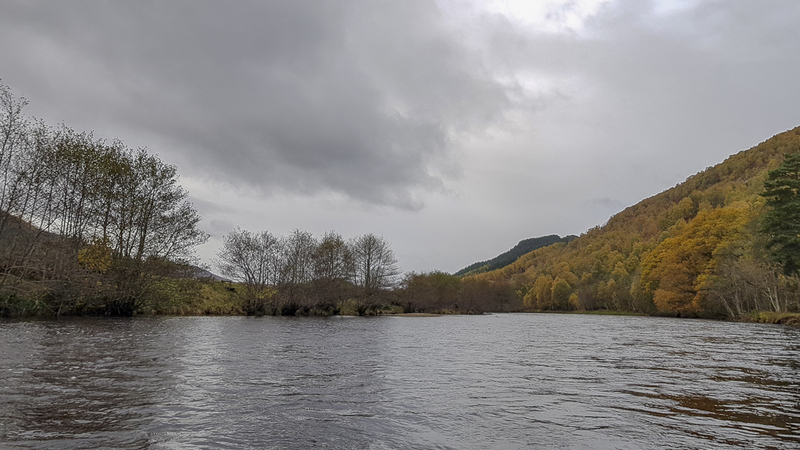 Fishing beats stretched along the bank, seats and steps with short grass on level banks – all a bit civilised, though it would make for easy launching. 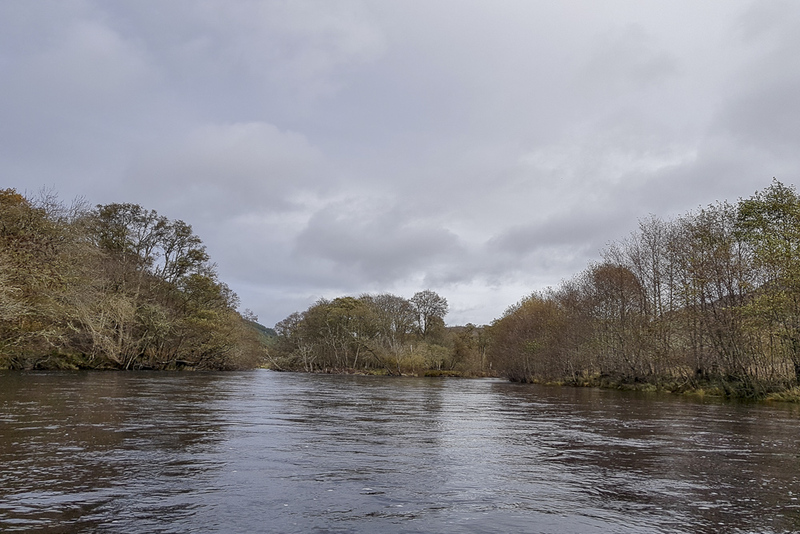 The River Cannich joined from the left not long after the bridge, swelling the volume of the river quite considerably. The overcast was breaking up now, some blue sky appearing overhead. 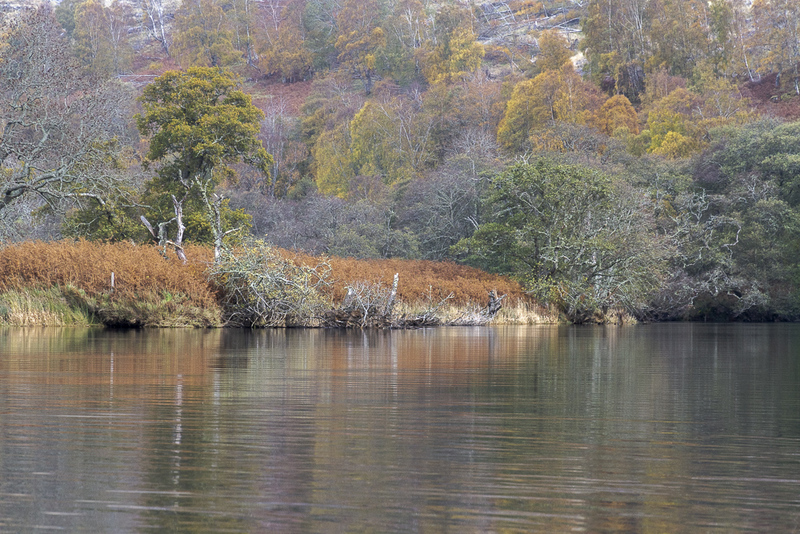 Strong yellows and golds livened up the woods along the banks, where stands of birch grew. 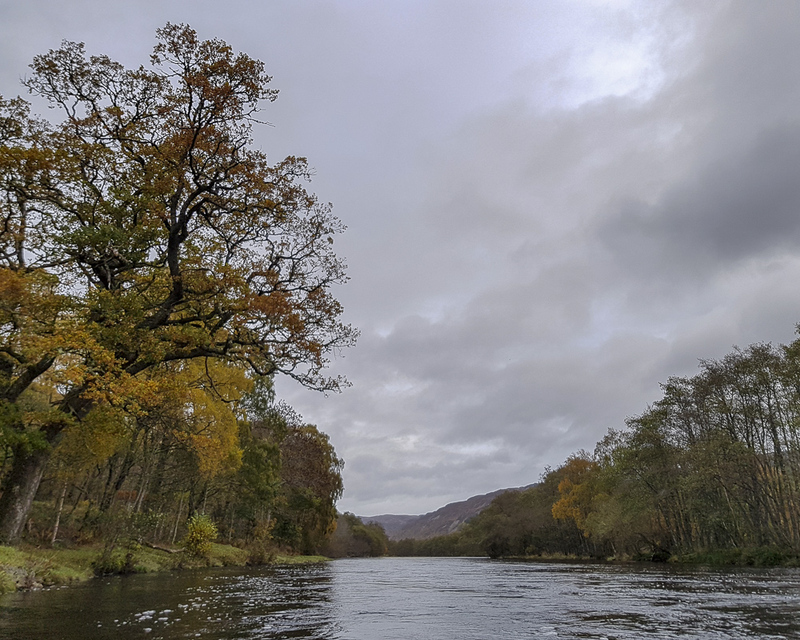 Passed the plantations, more natural woodland stretched along both banks, giving splashes of autumn colour that spread up the hillside. 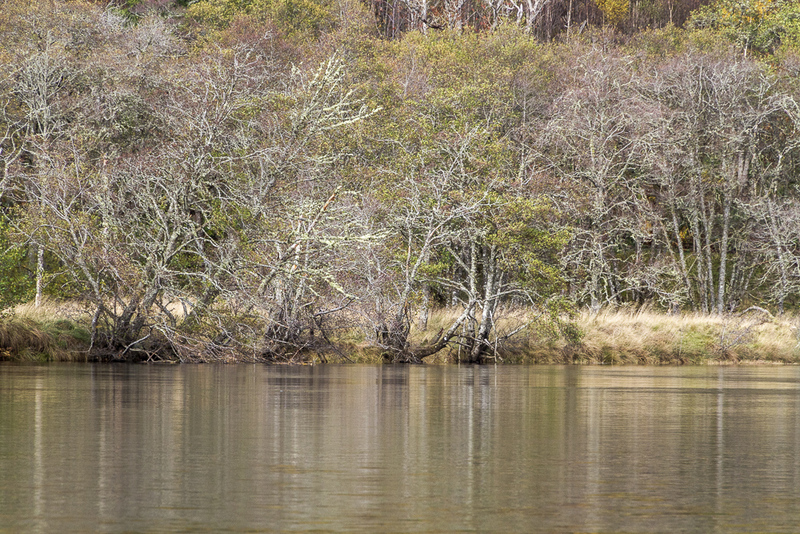 Stands of birch and alder stood at the water’s edge where a large sidestream rejoined the main flow. 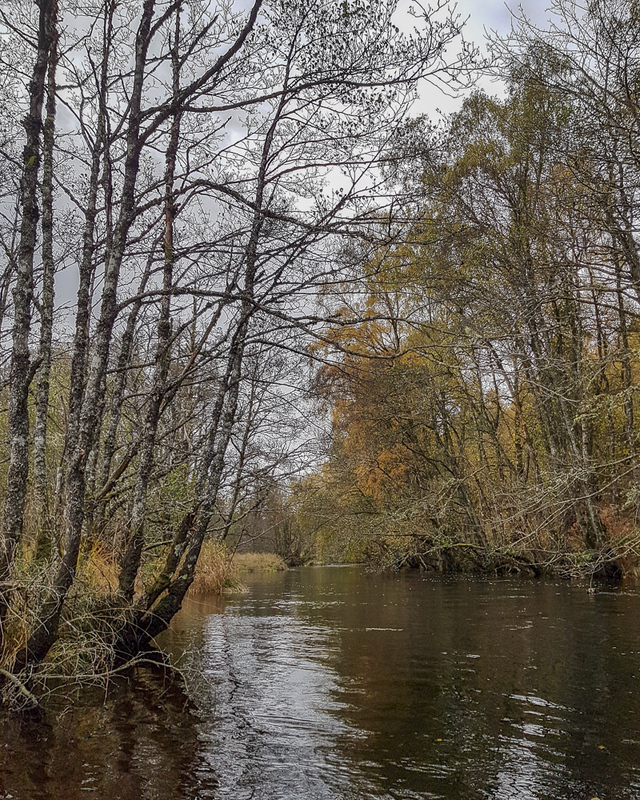 I turned into the confluence to enjoy a smaller landscape of autumnal woods and flowing water. 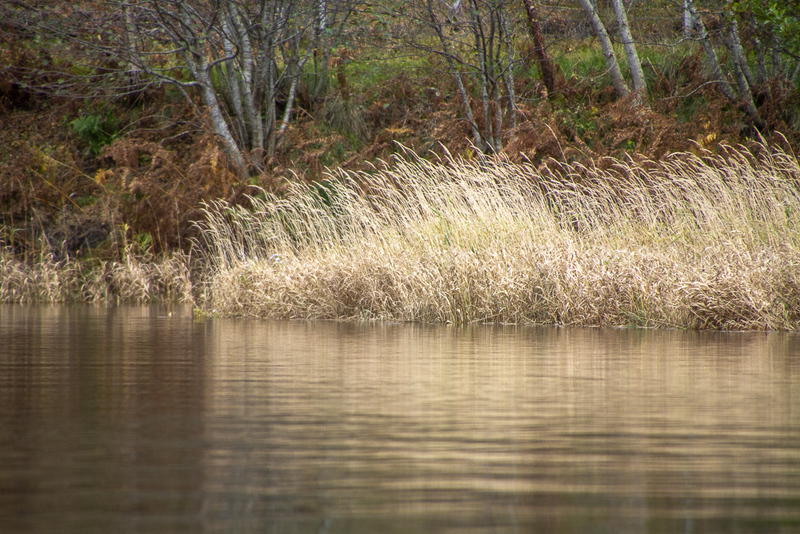 On river right an ox-bow lake was slowly filling in with reeds, and the river split again to bypass a series of small islands. 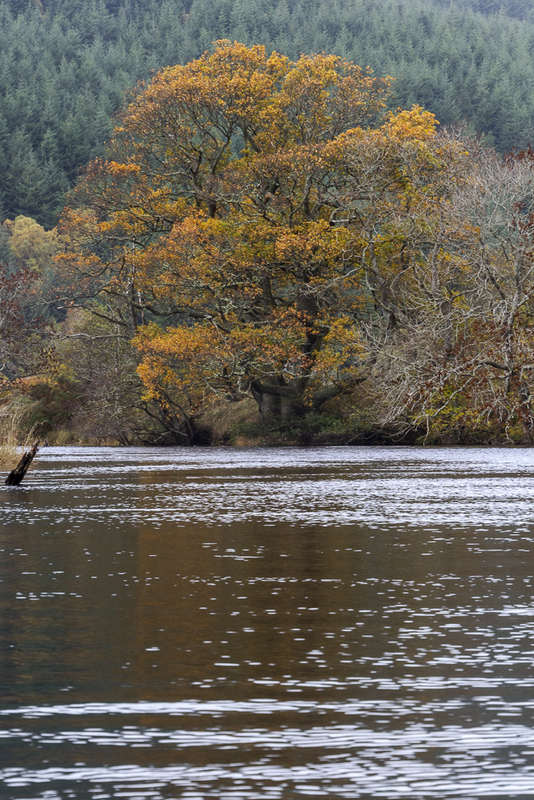 As the river passed by Carnoch Wood, it reunited and began to meander across the valley floor. The current dropped, and I found I was having to work harder to keep up the same ground speed.I decided it was time for some refreshements, so pulled into the bank. As the river now seemed to be quite flat, I took off the spray deck and rolled it up under the foredeck. 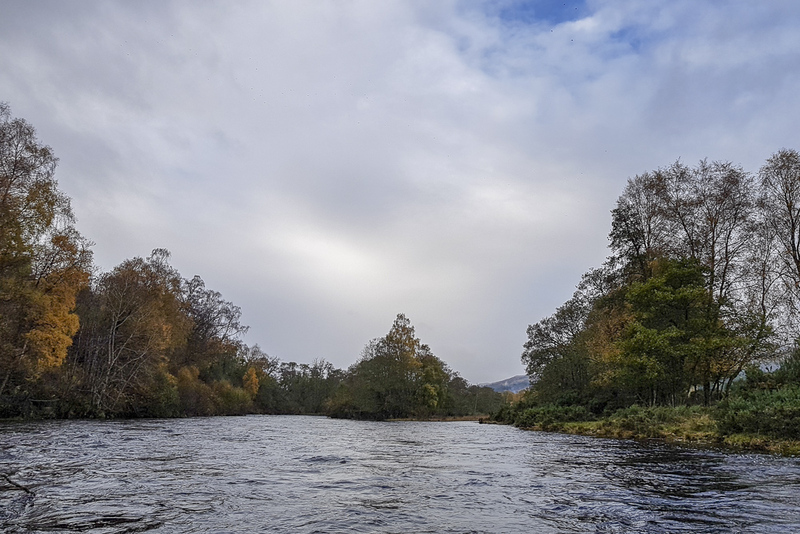 It had done a good job keeping me warm and stopping water from slopping in the bouncier bits further upstream, though it meant that I couldn’t access my camera in its bag on the floor of the boat. Up to now, I had just been using my phone camera, but could now bring out the dslr. 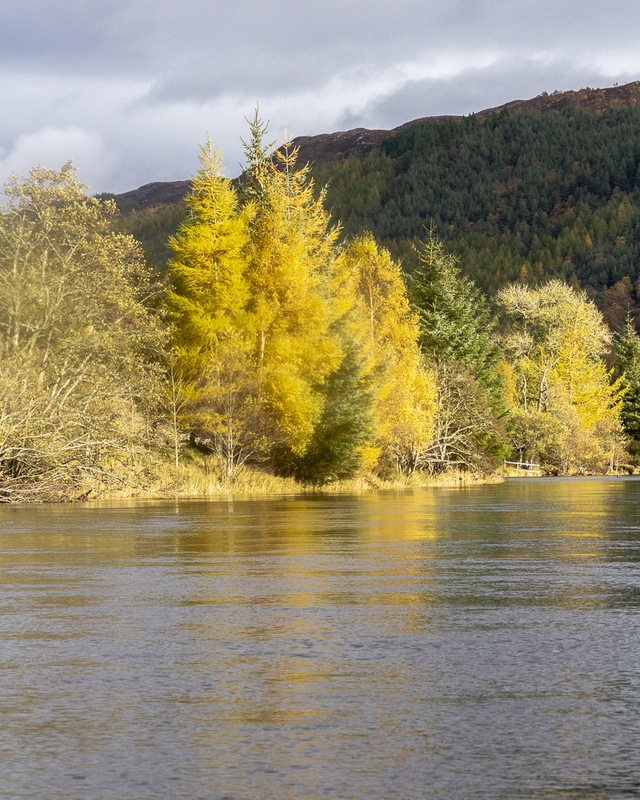 As if in response, the light improved as I set off again, lifting the colour of the foliage along the bank. 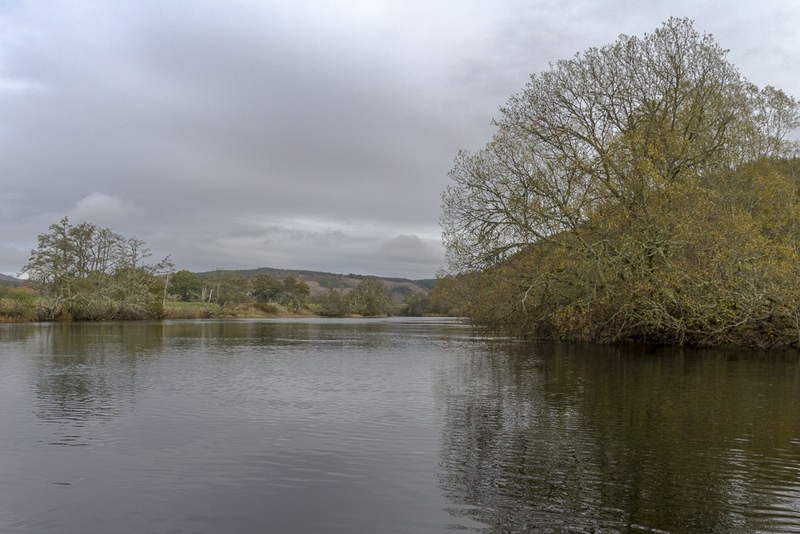 The wind had dropped too, so although I was now receiving little help towards my destination, the reflections on the river were wonderful. 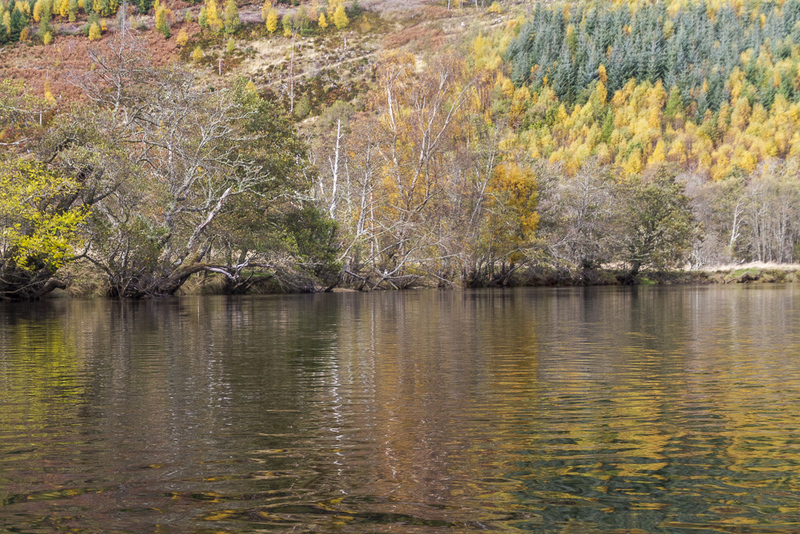 Birch and bracken gave a kaleidoscope of colour climbing through the woods as the river bent its way back and forth along the valley. 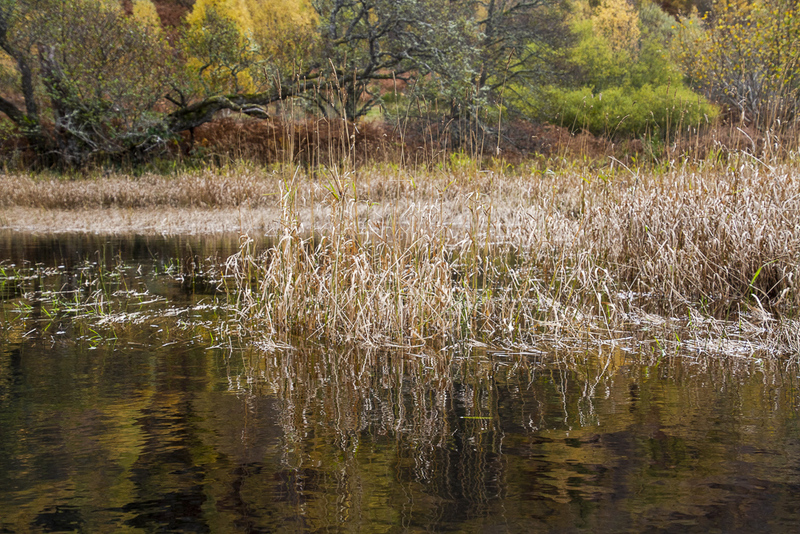 In a small blind channel under the hillside of Erchless Forest, winter grasses stood reflected in every detail on the mirror surface. 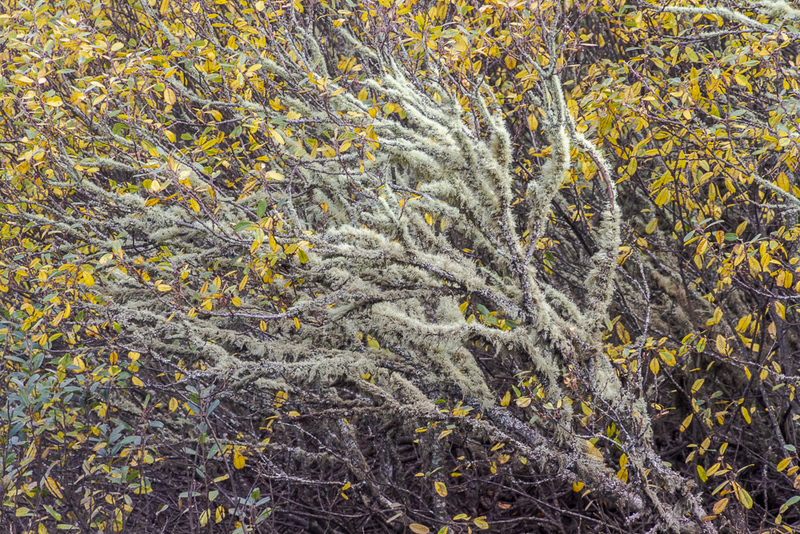 An oak, unusual for carrying rich orange leaves where most had been winter-drab stood in strong contrast to the spruce higher on the valley side. 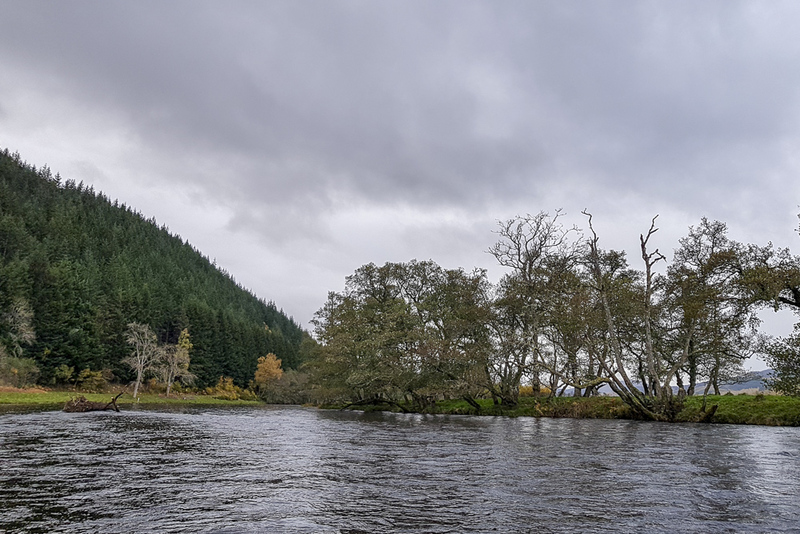 According to the map, an earthen fort, Dun Struthdaidh Beag, stood hidden in those trees, along with the remains of a broch, testament to long history of habitation in what can seem a very empty landscape. Just a couple of bends left now before Mauld Bridge would come into sight. 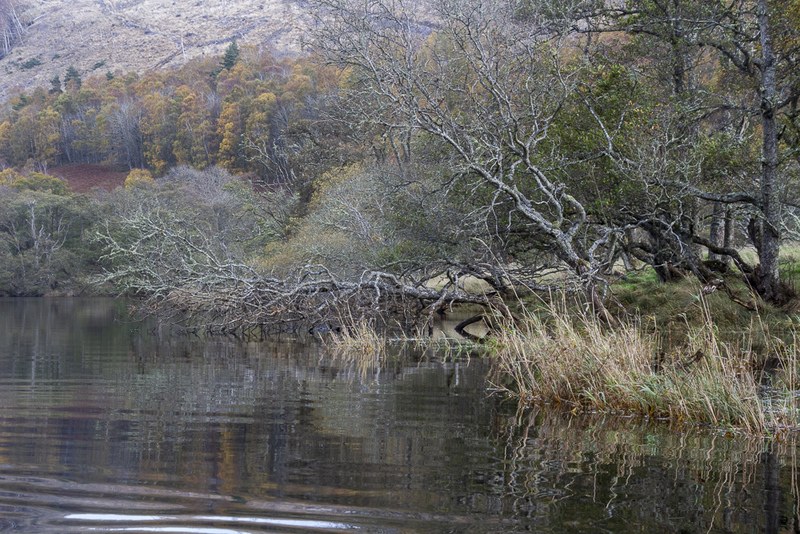 There was almost no current now, and I took time to enjoy the stillness and reflections. 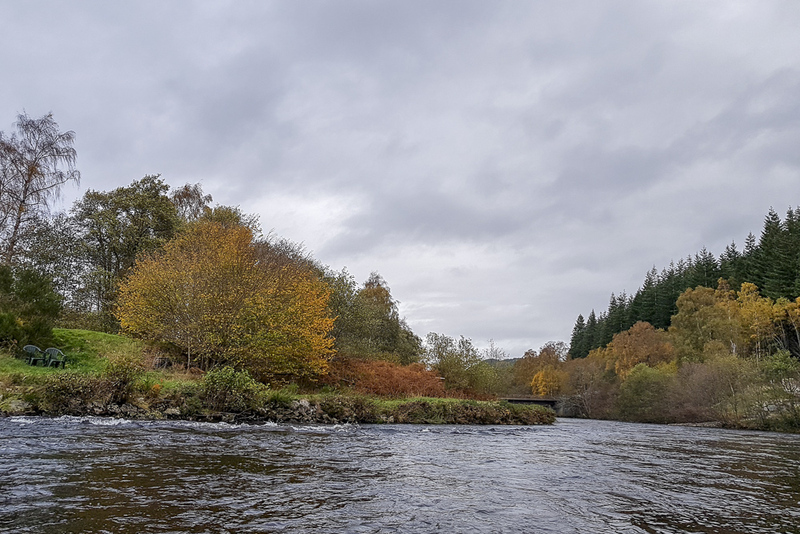 On river right, the valley side climbed steeply to the heights of Eskadale Moor, clothed with a scattering of mixed woodland, bracken and heather, while oak and birch grew along the banks and in the distance Mauld Bridge appeared. 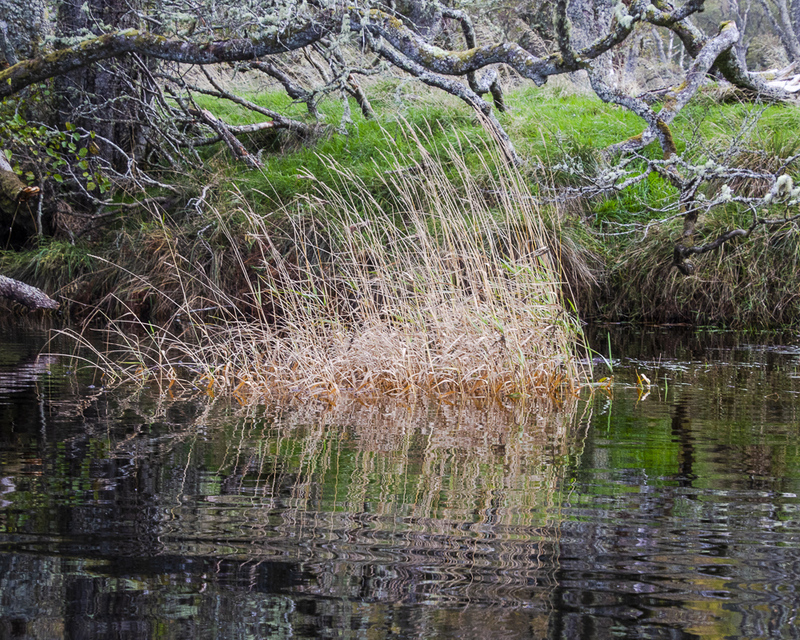 Small details caught my eye, a stand of grass growing in the shallows, downy lichen growing on stems of bushes. 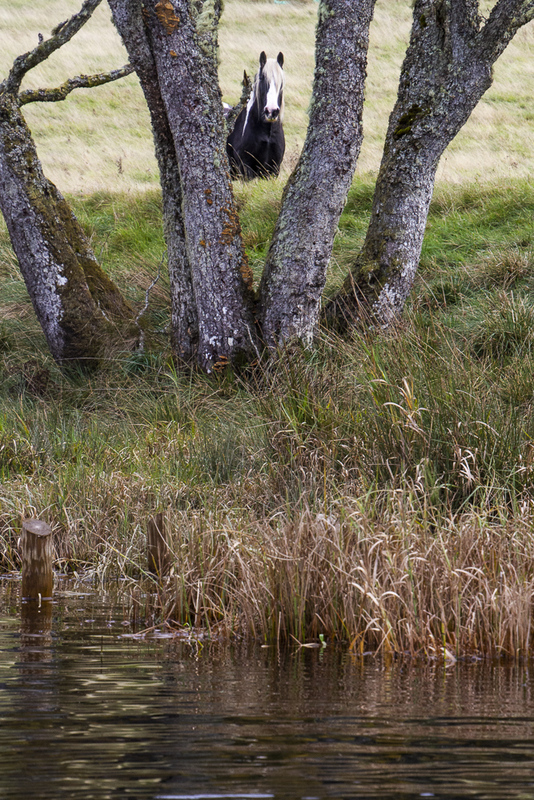 A horse placidly watched me pass, nicely framed by a group of trunks. In the final approach to the bridge, the current picked up quite markedly once more, but there was a handy eddy just beyond the pilings in which I stopped. My bike was where I left it, securely locked to a fence. The packraft was quick to deflate and fold away, and it wasn’t long before I had the bike loaded and ready to go – at which point I hit a snag. The key to the lock was not in my trouser pocket. It wasn’t in my pfd, or the camera bag. It wasn’t in the once more empty dry bag. I was 12km from the campsite and looking at a long walk in unsuitable shoes. Fortunately, the lady of the house over the bridge was kind enough to lend me a bolt cutter, which freed the bike and got me on my way. Thank you for the kindness of strangers! It isn’t everywhere you can knock on a random door to request a tool to help you break a lock without raising suspicion. The final leg of my journey was a straight shot back up the main road to Cannich. This might not sound inspiring, but the main road here is a quiet single carriageway through a beautiful valley – no hardship at all. I saw deer in the woods, hooded crows, and at one point a buzzard lifted off from the verge as I cycled by, flying shoulder to shoulder with me along the road for the space of ten wing beats, before veering away through a gap in the trees. Sheer magic! Back at the campsite, I had time for hot soup and a scone before the café closed. Not a bad end to a great trip. So what did I learn about the packraft on its second trip? It was comfortable over a long distance but handled a bit better with more weight on the front. The spray deck was effective, though I would have liked a couple of loops on it to secure a deck line for things like a camera, a map or a small day bag. I found it easier to stow compactly with the deck removed. And most importantly – don’t leave the key to the bike lock on top of your sleeping bag when setting off! I am especially not a fan of locks that can be locked without the key; that's just asking for trouble !!!! Very nice indeed.....memories of a 40 quid taxi ride concentrate my key thoughts these days. I agree with the need for some attachment loops on the spray deck. A lovely looking trip, that I've been meaning to do for ages. The key experience is inevitable. Wonder if all households have boltcutters in that part of the Highlands!! Thank you all. Needless to say, keys now get checked before departing! Mal - in an open boat (faster than the packraft) a trip all the way to Aigas would easily fit in a day, especially if not cycling the shuttle. Both this one and the Struy-Aigas trip only took half a day each.